Took part in my final 10k was m race for the year. It so funny. Just before this year, I have not ran any 10km race for a long long time and in the space of 4 months I have completed 3. But the only reason I signed up for this was that it was almost in my backyard. And it cost only $18. Cheap by local standard. So I wasn't expecting much from this. 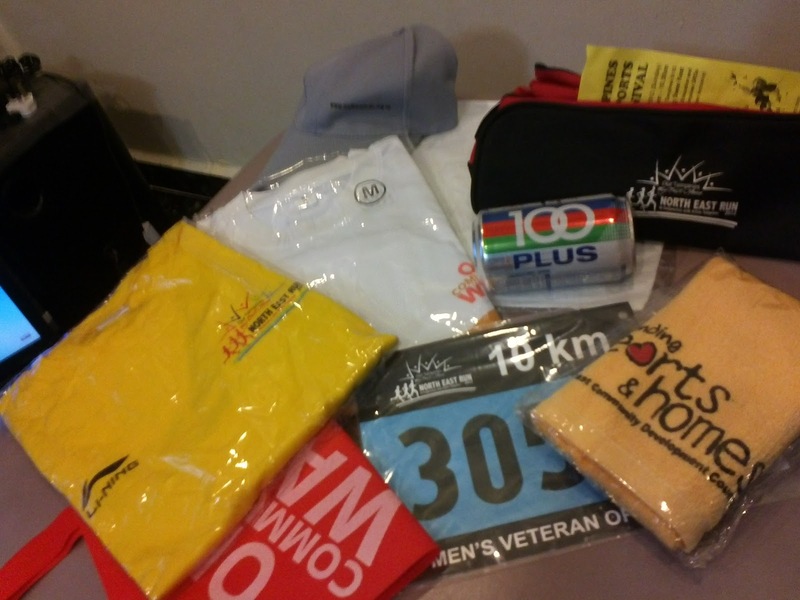 On the way to collect the race pack though, I was a bit worried about how "no frills" it was going to be. 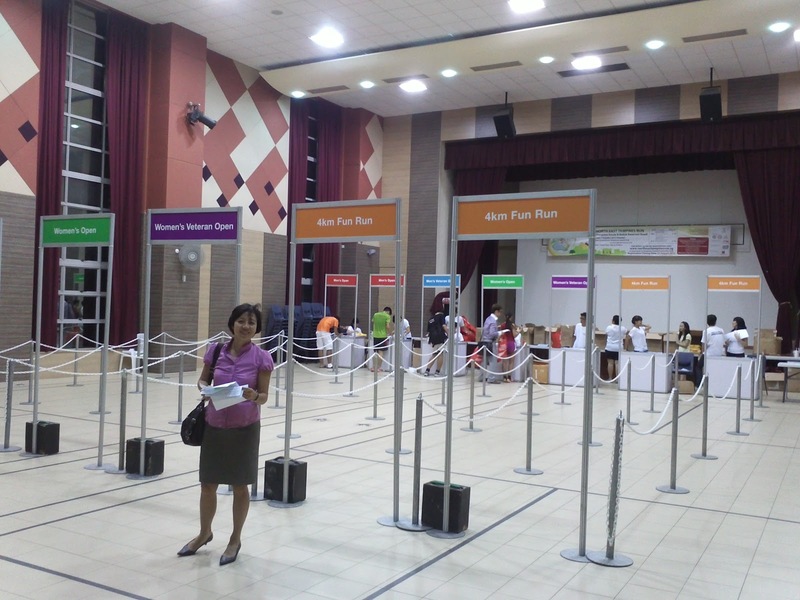 Race pack collection was only on 1 day and between 4pm to 9pm. I was like huh... don't tell me the response is so bad. I jokingly told the sidekick to expect aunties and uncles at the finishing line jotting down the runners' bib number for the race timing! 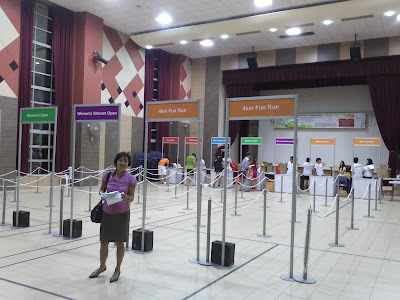 Imagine my surprise when we walked into the hall and saw the race pack collection setup. It was easily one of the most "pro" looking I seen here locally! And my respect for it went up a notch further when we collected the goodie bag. It was bulging with contents. And there were no usual useless discount vouchers for products and services which nobody ever uses. 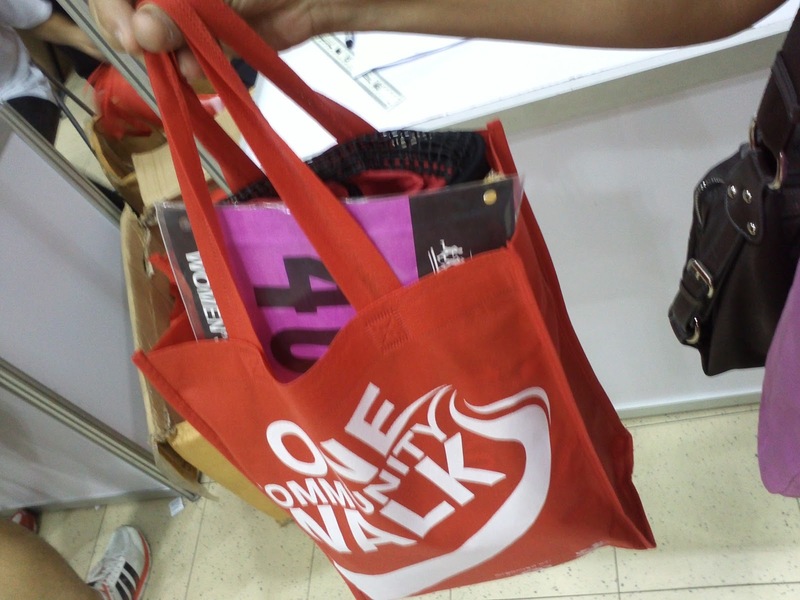 Instead, there were 2 tees including 1 Li-ning tee, a shoe bag, a can of isotonic drink, 2 towels and a race bib with timing chip! I couldn't believe my eyes. I know the grassroot organisation got a lot of money but that much? The good feeling continues on race day. There was a huge stage. Drinks including isotonic drinks and even bananas were readily available even before the race starts. There was even holding pen for the various timing including this one for those below 30 mins. Wow, either there are some very super elite runners taking part or the organiser are so confident of our local runners' ability! Everything appears wonderful and perfect for a great race. Even the weather was great! And then the runners were flagged off behind this balloon arch. Unfortunately, very that was good about the race ended here. The first 50 metres or so was along this very narrow pavement through the small park. Luckily, the number of participants were not that great so it wasn't so bad. Out onto Tampines St 83 and everybody just ran across the road even though there were no road closures and vehicles were travelling up and down. The runners should have kept right and cross the road at the junction but there were no barrier or marshal at St 83 to direct the runners down the road instead of crossing it. The lack of road closures and marshals extended all the way along the whole race route. Fortunately for me, I didn't have to stop at any road crossings although I saw one group in front of me having to stop once. The problems continued. We were supposed to run towards Avenue 10 after crossing the overhead bridge outside Temasek Polytechnic. Of course some people ran across the road junction instead of crossing the bridge. The route lead us into Bedok Reservoir and out of it onto Avenue 1 outside Temasek Polytechnic before crossing the first overhead bridge along the road. This is the route as shown on the race website. But because there were no marshal or directional signs within the reservoir, what everybody did was ran 1 round of the reservoir. This was the route as picked up by the GPS. Compare the difference! For us mortal runners, it didn't really make a great difference. The distance in fact came closer to 10km (9.8km on both me and the sidekick's watch whereas if running on the straight path of Bedok Reservoir Road and Tampines Ave 1, it will probably be a tad shorter. However, for some of the front runners, they ran an extra 2km to 3 km exiting the reservoir from the water pump side road. These resulted in favourites like Gary Goh, Mok Yin Rong failing to finish within the 10! What a let down for them! And this has to take the record for the most number of runners who ran off course! I think the problem was the lack of marshal at the Bedok Reservoir area. The runners turned into the carpark, ran along the reservoir and was supposed to run along the upper path instead of the lower dirt path but nobody guided the runners. Consequently, the runners missed the water point along this stretch as wellhe. So the smooth and good organising all went to pieces at the most critical part of the event - the running. The organiser did not specifically mentioned that there were two different overhead bridge to cross. One is going to Bedok reservoir and the other is coming back passing Temasek Poly overhead bridge. Everyone follow the front runner and run one round Bedok reservoir and back using the same overhead bridge. Overall is fine but can be improved. The main problem was the lack of marshal. If the marshals had been there to direct the runners, there wouldn't have been a problem. i was in the top 12 and i don't feel i deserve the placing. i'd rather not be standing there and have my photo taken. at the end of the day, everyone knows who the rightful winners are. there is totally no glory to be on the podium, at least for me.